So, you’re nursing your baby, but are soon going back to work, traveling or planning ahead in case an emergency arises and you need to be away from your little one. Whatever your situation, you need to know the best way to make sure your baby continues to get your nutritious breastmilk. Talk with your nurse about what type of breast pump may work best for you. Even if you don’t plan on being away from baby, having a manual pump and knowing how to use it can help in case of an emergency. Electric breast pumps are great for moms on the go who may need to pump at work or other activities throughout the day. When choosing a bottle system, start by trying one type of bottle before you invest in an entire line. Find one that first works well with your baby before you buy more. Read: How will I know if my baby is getting enough breastmilk? With the right equipment and just a few strategies you can pump and store breastmilk for your baby. Even though human milk has some special qualities that help keep bacteria from rapidly growing, it’s important to follow expert advice for handling breastmilk to avoid spoiling or wasting it. Always feed your baby fresh breastmilk whenever possible as it contains valuable antimicrobial factors, enzymes, and nutrients that may be destroyed by deep-freezing. Wash your hands before pumping and handling breastmilk. Always pump into clean bottles or storage bags that seal tightly. Refrigerate milk as soon as possible. Fresh breastmilk may be left at room temperature for up to 10 hours, or be stored in the refrigerator for 4 days (96 hours). If saving your milk, freeze it as soon as possible: use the coldest part of the freezer, not the door. Label/date your bottles or storage containers and bags and use the oldest milk first. Store your milk in 1 to 4 ounce increments so that you can get as much or little milk as you need each time. Use frozen breastmilk within 2 weeks if freezer is contained within a refrigerator, within 3 months in separate freezer (side-by-side), or 6 months in a deep freeze. Always clean your pump and storage equipment immediately after using with warm, soapy water and air dry. 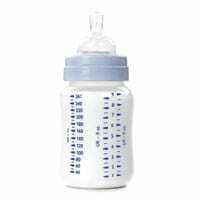 See: How can my partner feed our baby breastmilk? Never use a microwave to thaw or warm breastmilk. Hold the bottle of milk under cool or lukewarm running tap water or allow milk containers to stand in cool water until thawed. Keep the water level below the lid of the container to prevent water contaminating the milk. Warm the breastmilk in a warming device designed to warm human milk, or stand the bottle in a pan of warm, not boiling, water. Keep the water level below the lid of the bottle but above the milk to ensure heating throughout the milk. Always swirl the milk as it’s heating to ensure even heat distribution. Use frozen breastmilk within 24 hours after thawing. Do not refreeze thawed milk. If the milk fat separates out, swirl the milk to mix it. Always check the temperature of the milk against the inside of your wrist to ensure it’s safe for your baby. Discard any milk left in bottle after feeding.